on the YouTube homepage. The video included a Call to Action overlay that encouraged YouTube users to donate money to help build wells and provide clean, safe drinking water for those who don't have it. Feeling inspired? If you're a YouTube nonprofit partner, adding a Call to Action overlay is easy. Just go to "Edit Video" and fill out the fields in the section marked "Call to Action overlay." All you have to do is include a short headline, ad text, a destination url, and upload an optional image, and the overlay will appear whenever someone watches your video. If you're a nonprofit organization in the U.S. or U.K. who hasn't yet joined the YouTube Nonprofit Program, but would like to gain access to Call to Action and other special benefits, you can apply now at www.youtube.com/nonprofits. This week, we launched a new "Call to Action" feature for YouTube's nonprofit partners, which allows them to use InVideo overlays to drive traffic to an off-YouTube web page, where they can collect signatures, email addresses, or even donations. Already, we're seeing nonprofit organizations use this new feature with great success. 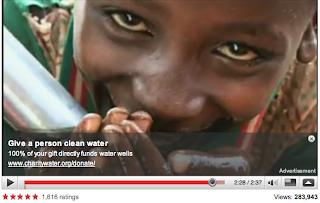 On Sunday, to commemorate World Water Day, we featured a video from charity:water on the YouTube homepage. The video included a Call to Action overlay that encouraged YouTube users to donate money to help build wells and provide clean, safe drinking water for those who don't have it. Hey, that's actually useful. I'm usually against InVideo ads, but this is an exception. That's super awesome. Wonderful idea. it's great to see non profits be put into this great system. This is a great idea, and would be even greater if a charity from other countries could participate. We look forward to it being expanded. Thanks for helping a country who has been almost invisible to the world at large. I have spent 50 years in the CAR and love helping bring Hope back to a forgotten country. Thank you Google. Personally I cant thank you enough. Do you have any similar fund-raising or sponsorship opportunities for regular small businesses just starting out? WE"D LOVE TO HAVE THIS!!!!! I did apply, and I'm a legit non-profit, but for some reason you felt it appropriate to decline my request. Is it b/c my organization is religious in nature? Why are you against religious organizations? @admiral202 kind of a chicken and egg situation... gotta have the money before you can show a video of the work done funded by that money.... though I think they are 'doing' and using the money already. Thank you for this good news, Ramya. Charity:Water is such a GREAT organization. I am going to take immediate action to use this overlay for my favorite charity in Africa - KENWA - Kenya Network of Women with HIV/AIDS. This is absolutely awesome! I can see how this can benefit a large range or organisations. I will be looking to do the same thing for Stop the Traffik - www.justgiving.com/ryankilfoil - I'm raising $10,000 by running the Rotorua Marathon! I believe the wider Internet community can stand behind the Fight against Poverty and that we cannot, we must not infringe upon the generosity of Governments and Millionaires to help funding. Individuals can play a key role in this global project and whatever we carve for today's world, sets a landscape for tomorrow and the next generation who will follow in our footsteps. This is nice and all, but WHY WONT THE VIDEOS PLAY!!!! They're all repeating that they're "No Longer Available." Youtube is pointless if you cant watch anything on it! This is excellent news, we will be looking at this for our UK appeal films at www.wateraid.org asap! What a great and valuable feature for charities! Great work! IF YOU HAVE ANY PEARL COHN BAND VIDEOS PLEASE UPLOAD THEM TO YOUTUBE CUZ I WANNA SEE SOME MORE VIDEOS CUZ THA ONES ON HERE NOW ARE OLD SO IF YOU HAVE SOME VIDEOS OF THE PEARL COHN BAND PLEASE UPLOAD THEM ON HERE PLEASE!!!!!!!!!!!!!!!!!!!!!!! THANK YOU. We have enrolled in the NonProfit program and trying to use the new callt-to-action overlay but it does not seem to work. We have filled all the forms in but the overlay still won't show up! Any ideas anybody? CDF launched a new video today using the overlay (thanks YouTube!). Here's my problem: I'm using YouTube's Call to Action Overlay for this video and it's working just swell if you view the video here:http://www.youtube.com/watch?v=JVsTcTYT0Ek, but not on our channel main page (http://www.youtube.com/childrensdefense) or when embedded on our website (http://www.childrensdefense.org/accidents). This is very cool, thanks for the helpful feature! One suggestion: It might be helpful to have a different label instead of "advertisement" in the lower right corner for call to action overlays. Maybe instead of "advertisement" it could read "call to action" or "non-profit partner program" or something that would distinguish the overlay from a paid advert. Otherwise, users might think YouTube is either charging non-profits for an ad placement, or that the non-profits are investing resources into YouTube ads. I think everyone would benefit from a more accurate label. Just a thought. Thanks again! This is kewl, count me in, a little help goes a long way. When is the Canadian program launching? Wow that is really good and a wonderful idea, it a great way to help worthy causes instantly. my organization got approved but i cannot see the CTA tab on the edit video button. and for the google checkout button, we already have an existing account. do we need to create another one?